Coming into today’s announcement of the Intel® Xeon® processor E5-2600/1600 product family, Intel has been sharing some striking statistics for computing trends that point to a need to improve server networking, bandwidth, and overall performance. According to Intel projections, by 2015, the number of networked devices will be in the neighborhood of 15 billion, with more than 3 billion users. Worldwide mobile data traffic alone is expected to have increased 18-fold by that time, driven by a jump in streamed content, mobile connections, enhanced computing of devices, faster mobile speeds and the proliferation of mobile video, according to the recently released Cisco Visual Networking Index (VNI) Global Mobile Data Traffic Forecast for 2011 to 2016. All of this means IT departments will need to increase data center bandwidth and enable faster data flow to servers if they want to meet the needs of demanding applications and avoid bandwidth meltdowns. Fortunately, a number of I/O innovations are here to help with that endeavor. As part of the Intel Xeon processor E5 product family launch, Intel announced two significant I/O innovations: the Intel® Ethernet Controller X540 and an important server platform feature, Intel® Data Direct I/O Technology. The Intel Ethernet Controller X540 is the industry’s first fully integrated 10GBASE-T controller and was designed specifically for low-cost, low-power 10 Gigabit Ethernet (10GbE) LAN on motherboard (LOM) and converged network adapter (CNA) designs. I’ve been dropping hints about this product for a while now, and I’m thrilled to say that 10 Gigabit LOM is finally here. With the Intel Ethernet Controller X540, Intel is delivering on its commitment to drive down the costs of 10GbE. We’ve ditched two-chip 10GBASE-T designs of the past in favor of integrating the media access controller (MAC) and physical layer (PHY) controller into a single chip. The result is a dual-port 10GBASE-T controller that’s not only cost-effective, but also energy-efficient and small enough to be included on mainstream server motherboards. Several server OEMs are already lined up to offer Intel Ethernet Controller X540-based LOM connections for their Intel Xeon processor E5-2600 product family-based servers. This new controller also powers the Intel® Ethernet Converged Network Adapter X540, a PCI Express* adapter for rack and tower servers. 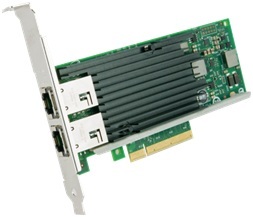 10GBASE-T solutions based on the Intel Ethernet Controller X540 are backward-compatible with Gigabit Ethernet networks, giving customers an easy upgrade path to 10GbE by allowing them to deploy 10GBASE-T adapters in servers today and add switches when they’re ready. Another major benefit of 10GBASE-T is its ability to use the cost-effective, twisted-pair copper cabling that most data centers use today, meaning an expensive cabling upgrade won’t be required, and 10GBASE-T’s support for cable distances of up to 100 meters provides flexibility for top-of-rack or end-of-row deployments in data centers. The Intel Ethernet Controller X540, like other members of the 10 Gigabit Intel Ethernet product family, supports advanced I/O virtualization and unified networking, including NFS, iSCSI and Fibre Channel over Ethernet (FCoE). Intel Ethernet controllers and converged network adapters are also optimized for new I/O advancements in the Intel Xeon processor E5 product family. One key related feature that should generate some attention is Intel® Data Direct I/O Technology (Intel® DDIO). 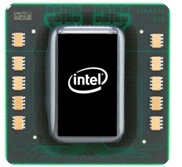 Intel DDIO allows Intel Ethernet controllers and adapters to talk directly to processor cache, avoiding the numerous memory transactions required by the previous-generation systems. Eliminating these trips to and from system memory delivers improvements in server bandwidth, power consumption, and latency. Intel DDIO is a key component of Intel® Integrated I/O, which integrates the PCI Express* controller directly into the processor to further reduce I/O latency. The level of improvement enabled by these technologies when combined with Intel Ethernet 10 Gigabit Controllers can be pretty extraordinary. Together they can deliver more than three times the bandwidth of a previous generation server, and tests in Intel labs have shown even higher peak performance levels. There’s much more to say about the Intel Ethernet Controller X540 and Intel DDIO, so I’m going to spend my next couple of posts doing just that. Next week I’ll take a closer look at the Intel Ethernet Controller X540 and 10GBASE-T, and the following week, I will dig deeper into Intel DDIO and Intel Integrated I/O. (I/O Bandwidth) Source: Intel internal measurements of maximum achievable I/O R/W bandwidth (512B transactions, 50% reads, 50% writes) comparing Intel® Xeon® processor E5-2680 based platform with 64 lanes of PCIe* 3.0 (66 GB/s) vs. Intel® Xeon® processor X5670 based platform with 32 lanes of PCIe* 2.0 (18 GB/s). Baseline Configuration: Green City system with two Intel® Xeon® processor X5670 (2.93 GHz, 6C), 24GB memory @ 1333, 4 x8 Intel internal PCIe* 2.0 test cards. New Configuration: Rose City system with two Intel® Xeon processor E5-2680 (2.7GHz, 8C), 64GB memory @1600 MHz, 2 x16 Intel internal PCIe* 3.0 test cards on each node (all traffic sent to local nodes).